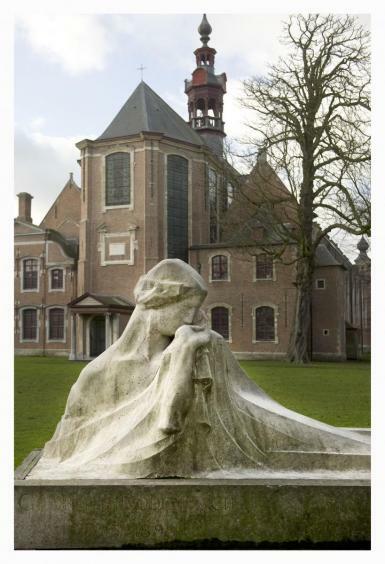 In 1898, for the Partie Ouvrier Belge, Minne designed a monument for the suddenly deceased journalist and socialist foreman Jean Volders (Brussels 1855-Schaarbeek 1896). 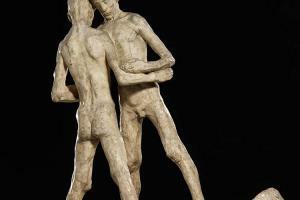 The project depicted two naked, straddle-legged young men who hold each other in balance on the forecastle of a ship. In his sketchbook of 1894-1898, we find no less than 16 study sketches for this project. As Minne was informed that his presented theme was not accepted, he destroyed the three-metre high plaster project in front of Henry Van de Velde. 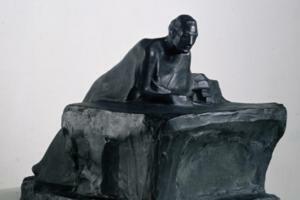 The smaller plaster model was still exhibited that year at the exposition Arts and Crafts in The Hague under the title of Solidarity. There also exist versions in bronze and marble. The KMSKA possesses a plaster and a bronze version of the work. In 1899 the Société des Artistes et Ecrivains Français gave Minne the assignment to design a memorial for the memory of the French-language Ghent writer George Rodenbach. 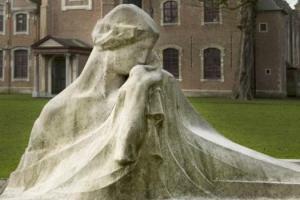 The name of the memorial is known by the name Bruges la Morte, after the eponymous novel of Georges Rodenbach. 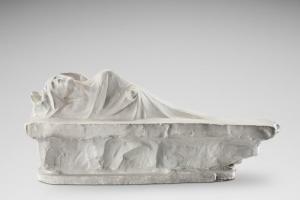 The first plaster model, in which a dying woman lies half-sunken in the block was never carried out. The ultimate design, executed in marble, is found in the Sint-Elisabethbegijnhof in Ghent, where in 1903, it was erected, after being subsequently turned down by Bruges and Doornik. After 1900, various assignments still followed. The Orator-an unusual theme in the oeuvre of the artist-can be thought of as a memorial and probably has something to do with a commission. The MSK holds a bronze version of the sculpture, of which there also exists a marble version. From 1906 to 1909 the German mecenas Karl Ernst Oshaus ordered from Minne three funerary monuments in marble for his family. The artist opted for allegorical figures in each case. Stylistically Minne searched for the connection to the style of the Georges Rodenbach monument and the Fountain with Kneeling Youths. He was, however, no longer able to achieve the pure stylising and stark form from earlier times. 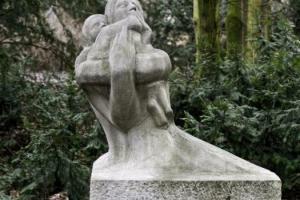 After the First World War, Minne also received a number of orders, amongst which were the memorial for Emile Claus in the garden of the Villa Zonneschijn (the painter's house in Astene) and the Queen Astrid Memorial, which is now found in the City Park in Antwerp. 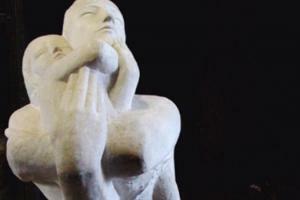 The latter sculpture is developed from the planned, though never executed Monument of Peace from the beginning of the Thirties and depicts a Mother and Child.